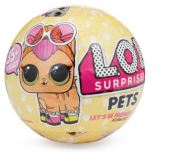 Thursday 25 Apr - Latest - LOL Surprise Pets are currently in good supply throughout the UK. Buy from Amazon Germany.Click the 'Globe' symbol on the Amazon.de top bar for English language (or bottom bar on mobile devices). Use your existing Amazon UK account details to order. Exactly the same as you would buy in the UK. If your French isn't great, the Google Chrome Browser is good at translating the webpage into English or copy and paste text into Google translate. We constantly check for LOL Surprise Pets stock, so you don't have to. Receive email alerts when LOL Surprise Pets online stock is found.